It’s that time of year again, where you get to hear me be silly and talk about stretchy pants and soggy pie bottoms on the radio with Missy Maki. She is an amazing talk show host with a weekly show on KPAM 860, Sundays from 10am-12. This is the second year she has put this show together of local bloggers sharing recipes using local ingredients. Last year I shared an apple pie recipe, and a mashed yams recipe. After hearing so many people are terrified of making pies, I decided to share the pies cousin, a galette. It is rustic pie, basically, baked on it’s own without a vessel. I thought this could be less intimidating, and equally delicious. I prefer galettes to pies simply because the ratio of filling to crust. The flaky crust is where it’s at for me, so more crust equals better. Hence my obsession with galette. How easy will this be, you ask? So super easy. Follow the photos, ask me questions, and you are in major galette business. Freeze the other dough half not used, or double the recipe for the filling. 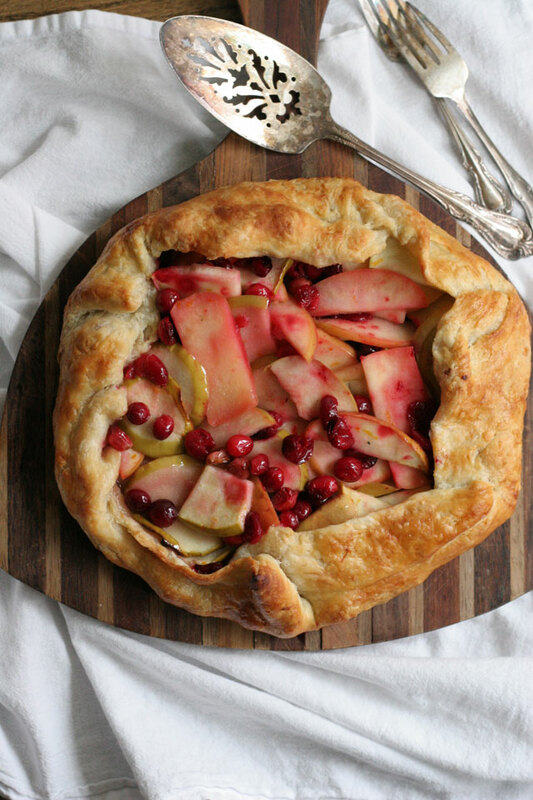 You can freeze the entire galette with the fruit filling until needed for up to 6 months. When needed, place in oven at 400 degrees, bake for 50 minutes. For the Cranberry Filling: A few approaches here, use an already made cranberry sauce if you have one on hand, make this cranberry sauce I just made, or cook the cranberries following these simple instructions below. Cook all of the cranberry filling ingredients in a medium saucepan for 15 minutes. Set aside to cool while preparing dough. Preheat oven to 400 degrees. Place the oven rack at the bottom of the oven for best results, and to prevent a soggy bottom. 1. Place the flour, sugar, and salt in a bowl, whisk. 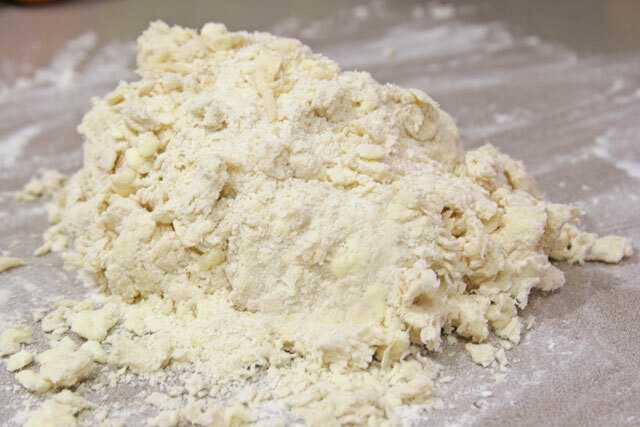 Add the super cold cubed butter chunks, and rub the flour into the butter with hands until pea sized butter is achieved, working quickly but gently, as to not overwork the dough. 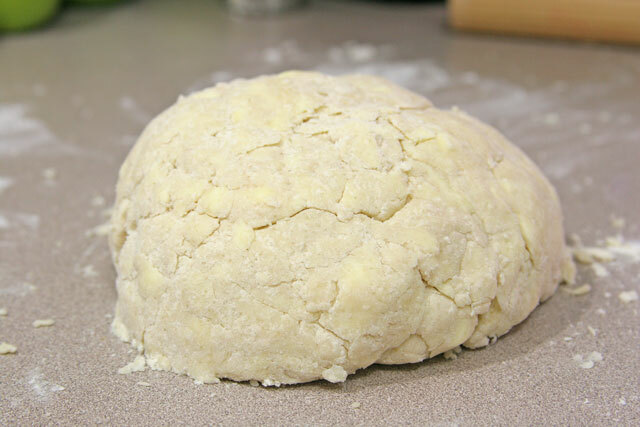 Add a couple of tbsp of water to bring the dough together, you may need to add more if the dough is too shaggy. 2. Place the dough on a lightly floured counter, and bring the dough together with your hands. Cover with plastic wrap or towel and place in the fridge for 15 minutes. Start working on the apple filling. Place the apples. sugar, salt, orange juice and flour in a bowl. Add the cranberry sauce to the apples, once the cranberry cooled down. 3. Take the dough out after 15 minutes and roll it out to 1/2 inch thick. Take 1/3 of it and fold it in, then fold the other 1/3 in. Place in fridge again for 15 minutes. Remove dough from fridge. Lightly dust counter with flour. Cut dough in half using a bench scraper or knife. Roll dough out to 1/4 inch thick. 4. Place rolled out galette dough on a sheet pan. Place the apple cranberry filling in the center of the galette. 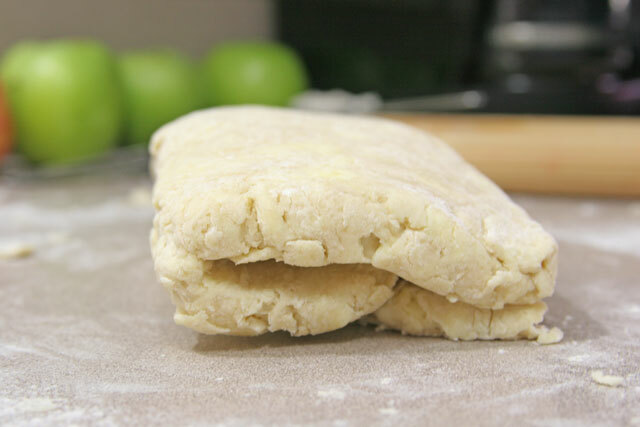 Fold sides of the dough over the fruit. Brush sides with the egg wash.
At this point, bake for 40 minutes, or place the sheet pan in the freezer. Freeze raw galette with filling for 30 minutes. Place in a freezer bag. Remove and place in oven to bake when needed. If baking frozen galette, bake for 50 minutes. 1. Place the cream, salt, and sugar in a bowl. By hand use a whisk until whipped cream soft peaks are formed, or use a mixer with whisk attachment until soft peaks are formed. Serve with galette. Yay for stretchy pants on Thanksgiving (and maybe the day after). I personally love galettes more than pie, but I think it’s because I’m less of a sweets person and like savory, and there are so many savory versions of galettes! Gorgeous photos – I always appreciate seeing exactly how the dough is supposed to look. Thank you so much! I am still in stretchy pants by the way:).